The book of Isaiah is named for its author, the prophet Isaiah. 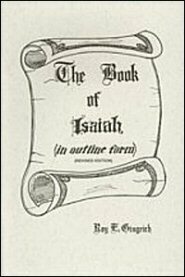 Isaiah means, “Jehovah is salvation” or “Salvation is of Jehovah.” He is rightly called “the Evangelical Prophet of the Old Testament.” By common consent, he ranks among the great literary geniuses of all time and his book is recognized as a part of the world’s great literature. According to tradition, Isaiah was martyred, sawn asunder, Hebrews 11:37. Just so, in the hands of destructive modern critics his book has suffered, being cut up into many parts. Consequently, liberal Biblical scholars today deny the unity as well as the Isaiahan authorship of this great work. They affirm that it is the product of various authors, writing at different times, long after Isaiah’s death. Then an unknown redactor combined the various elements into the book that we know today as Isaiah. In view of the above errors, it is refreshing to read Mr. Gingrich’s thoroughly orthodox, expanded, analytical outline of Isaiah. His exposition comes from a balanced and responsible conservatism which gives the work an abiding value. Like his other books, this one begins with a full general introduction, treating such topics as authorship, unity, historical background, importance, etc. This is followed by a succinct exegesis and explanation of the text. Both the layman and the busy preacher can use this commentary and quickly come to the heart of a passage and receive much help. In view of the above errors, it is refreshing to read Dr. Gingrich’s thoroughly orthodox, expanded, analytical outline of Isaiah. His exposition comes from a balanced and responsible conservatism which gives the work an abiding value. Like his other books, this one begins with a full general introduction, treating such topics as authorship, unity, historical background, importance, etc. This is followed by a succinct exegesis and explanation of the text. Both the layman and the busy preacher can use this commentary and quickly come to the heart of a passage and receive much help.